Instagram has over 1 billion users across the world. So, it is no surprise that many business owners are flocking to the ‘gram with high hopes and a desire to make their brand ‘Insta-famous’. 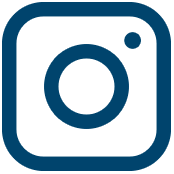 Heck, did you know that there are over 200 million people who visit at least one Instagram Business profile a day? YOWZA! In fact, 60% of Instagrammers say that they’ve discovered a new product on Instagram! We’re often so excited to get started that we miss out on perfecting the details of our Instagram Business profiles. And that is actually a big reason why some businesses struggle on Instagram from the get-go! If you want to start things off on the right foot, you’ve come to the right place. Today we want to share with you *all* the secrets. We want you to be able to set up your Instagram Business profile for success and achieve massive growth as soon as you launch. The first step to creating your best Instagram Business profile possible is to choose the perfect profile picture. What will work best for you depends entirely on what type of business owner you are. If you are a freelance creative you really do have the world at your feet! You could use your profile picture to display a high-quality photo of yourself. It could be your logo, or it could even be something abstract and ultra-creative. 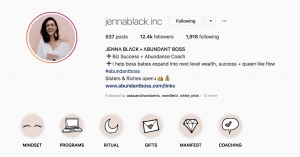 Whether you’re a health coach or a marketing consultant, having an Instagram Business profile can give you a real boost. Things like easy-to-use contact buttons and handy-dandy analytics can be a huge help. When it comes to your profile picture, if you are working with clients 1:1 our top tip would be to use a fantastic headshot. Your profile picture headshot doesn’t need to be stuffy and bland – show your personality! Think outside of the box while using colors and backdrops that are on-brand for you. Whether you’re the marketing manager of a national or even an international brand when it comes to your profile picture it’s best to keep it consistent with how your brand is presented in other mediums like marketing collateral. Basically? Use your brand logo! Ooh, now we’re talking! If you’re an Influencer and you want to work with large brands making the shift to an Instagram Business profile is a great choice. With your profile picture you can be creative, however, it is recommended that your profile picture is either an on-brand pic of you (i.e. edited the same way as your grid content) or a creative illustration of you. As a small business owner (with a plan to grow!) the best thing that you can do for your Instagram Business profile is to use a professional, high-resolution version of your main logo design as your Instagram profile picture. Be sure to keep the text inside the perfect Instagram profile picture circle so that it is easy to read and looks great! The next essential element of any freak’n amazing Instagram Business profile is a catchy bio description. Your Instagram bio description should appeal to your ideal customers and make that little voice in the back of their head say ‘Hmm, this is a business I like the sound of!’ as soon as they read it. Be sure to mention any unique facts about your business including if your products are cruelty-free, sustainably made, or if you donate a portion of sales to charity. If you are a service provider or a consultant, be sure to mention what you specialise in. Or, go a step further and string a sentence together that perfectly describes the greatest outcome your clients have after working with you. 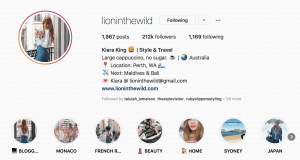 Here are two fantastic Instagram bio examples to inspire you! 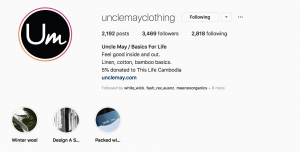 PRO TIP: For an even better result for your Instagram Business Profile be sure to put a keyword that relates to your business in your ‘Instagram Name’ section. 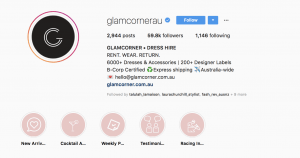 @glamcornerau mention Dress Hire and this will help them to show up in searches for dress hire on Instagram. Once you’ve perfected the ‘top’ section of your Instagram Business profile you will be ready to start scheduling your Instagram content. If you want to get the best results possible (and make sure you don’t forget to post!) scheduling your Instagram content in advance is the key to your success. To make a fantastic first impression on potential followers (and set up your Instagram Business profile for growth) from day one, make sure that your photography and videos are high-quality and work together to tell a visual story. Follow a clear color palette (usually your brand colors). Use an app like Plann to visually design your Instagram grid. This is so that you know what your content will look like side by side when posted to Instagram. The Plann app also offers Instagram Analytics which will help you to review your content after posting and discover your best performing hashtags, your best posting times, and even your best-performing colors. WOWZA! PSSST-> Plann is getting a desktop version soon, get yourself on the waitlist and go in the draw to win a share in over $70,000 worth of prizes. As well as organising and scheduling your Instagram feed content, you should also take the time to plan out your Instagram Stories content so you can make a flipp’n awesome first impression. For best results have a new Instagram Story each day and create a clear content strategy for your stories so that your followers will keep coming back for more. 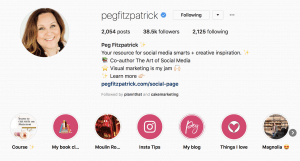 If you’re just getting started with Instagram Stories (AKA: you have ZERO ideas what these are for!) we have bucket loads of blog posts dedicated to Instagram Stories. Here are just a few that can help you on your way. Phew! That was a lot of blogs! Having a clear Instagram Stories strategy and a week of Instagram Stories content prepared when you first set up your Instagram Business profile is a sure-fire way to grow your account like crazy and keep your followers entertained in between your Instagram feed posts. When you’ve finished setting up your Instagram bio, scheduling your content and preparing yourself mentally for your new Instagram account… it’s time to make that announcement!!! If you’re already on Facebook, make sure to share the news of your Instagram Business profile over there. Got an email list? 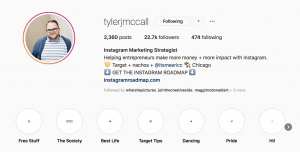 Let them know about your new Instagram Business profile too! Now, what about that LinkedIn profile? Dust that one off and make a post about your new Instagram Business profile. 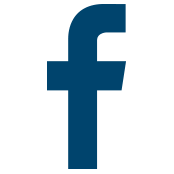 Heck, even share a snippet of your first post to excite everybody and get them over there. PRO TIP: A great way to gain followers on a new account is to have a competition within the first few days of launching! An incentive like that works like a charm. 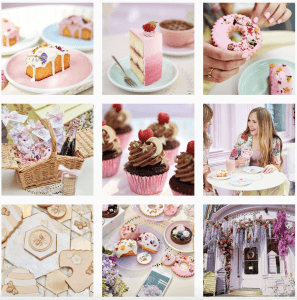 Once you’ve set up your Instagram Business profile for growth with the previous tips, your announcement should be a piece of cake. Go out there and confidently spread the word, we know you’ve got the goods! 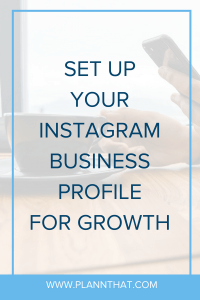 Want to really set up your Instagram Business profile for growth? Well then, why not set an Instagram Advertising budget for yourself?!. This will start reaching your ideal followers with some attention-grabbing ads. Instagram Ads can be creative, eye-catching and a wee bit of fun. Best of all, they’ll help you to get in touch with your target market straight away. It’s a great strategy for giving your Instagram Business profile a boost from the beginning! WOWZA! After going through all this we know for sure that your Instagram Business profile is going to knock the socks off of anyone who comes across it. Best of luck from team Plann – we know you have what it takes for massive growth! PSSST -> If you want first dibs on the desktop version of Plann (launching soon) with new in-depth Instagram Analytics and the features you already know and love, join the waitlist here. Follow @mackaylapaul on Instagram to see more of Mackayla’s work or at mackayla.co!